K-pop star and Philippine tourism ambassadress Ailee is on a roll with her second mini-album "A's Doll House," topping Billboard and other Korean charts. Billboard announced that Ailee topped the K-pop Hot 100 chart with her title track "U&I." "2013 has been good to female soloist Ailee, who nabs her first solo No. 1 on the K-Pop Hot 100 this week," according to Billboard.com. The song, which Billboard.com says has a "serious Christine Aguilera vibes," rose to the top of the chart after debuting at No. 3 in the previous week. "A's Doll House" contains six songs that also includes "No No No," "Rainy Day," "Scandal" and "I'll Be OK."
"U&I" achieved an "all-kill" status when it topped various charts in Korea upon its release early this month. In addition, Ailee has won two music TV show awards so far for "U&I." She won on "Show Champion" last July 24 and on "Music Bank" last July 26. On the Gaon Digital Chart, "U&I" rose to the No. 1 for the week ending July 20. It is also No. 1 on the Streaming and Download charts, No. 2 on the Mobile chart and No. 6 on the BGM chart. "A's Doll House" is currently No. 6 on the Gaon Album chart. MTV Buzzworthy Blog has chosen "No No No" and "U&I" as two of the nine "K-pop Songs of the Summer." For "No No No," the MTV blog says, "We can't tell if Ailee's track sounds more like Amber Riley singing a Katy Perry song on an episode of 'Glee,' or Katy Perry singing along with Amber Riley while watching an episode of 'Glee.' Either way, 'No No No' is the perfect song to belt with the besties as you all light sparklers and watch the summer sun set." "U&I" was also chosen "because girlfriend's voice is too big for only one spot on this list." Since her debut last year, Ailee has won numerous awards. This year, she won as best new artist in the Golden Disk Awards, Seoul Music Awards and Gaon Chart K-pop Awards. 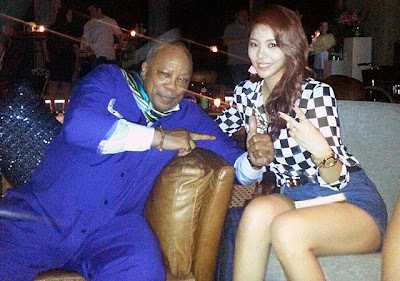 Ailee has also been tapped to promote Philippine tourism to Koreans, who are the No. 1 tourists in the country. The singer visited the country last April to shoot videos for the tourism campaign.